This is our custom-built Adapter or Specialty cable. Construction is Neutrik connectors with Horizon Lo-Z1 cable. Neutrik connectors are some of the best connectors around. 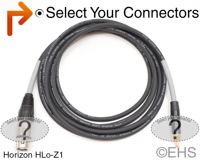 Horizon Lo-Z1 is a balanced "microphone cable" style cable and is very flexible, durable, light-weight cable. Photo 1 shows 10' cable with XLR female and RCA black and gray shrink label. Photo 2 shows one option for the two ends with XLR female and RCA black and gray shrink label. For a comparable unbalanced instrument cables we recommend the Hi-Z1 cable CLICK HERE.